DiMenna-Nyselius Library is pleased to provide online access to The New York Times to the Fairfield University community. The Group Pass effectively provides each Fairfield University student, faculty and staff an online subscription to the nytimes.com site (no more paywalls!). This service gives students, faculty and staff full access to NYTimes.com, NYTimes mobile apps, NYT inEducation, as well as their international editions. Please note this subscription does not include e-reader editions, Premium Crosswords or The New York Times Crosswords apps. In addition, users can discover and share content on social networks, save articles, subscribe to email newsletters of areas of interest and receive news alerts, either on predefined topics or through a keyword search the user designates. On campus (connected to our network) go to nytimes.com/grouppass. If off campus, please use this link to activate your pass. Create a free NYTimes.com account using your school email (Fairfield.edu) address. If you already have an NYTimes.com account using your school email address, you may log in with those credentials. Now you can enjoy seamless full access to NYTimes.com just by logging into your NYTimes.com account from any location, on or off campus. If you have trouble grabbing a pass, it could be because you have an existing NY Times account. Please see box below for assistance. Hint: Remain logged into your NYTimes.com account to have seamless access to NYTimes.com and our mobile apps for the duration of your Pass. 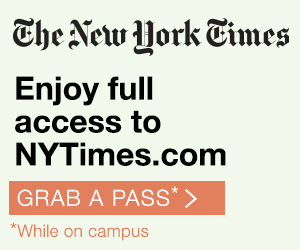 Visit https://myaccount.nytimes.com/grouppass to view your Pass eligibility and expiration timestamp at any time. If you have an existing NYTimes (unpaid) account, you do not need to "Create Account" on our welcome page; instead choose "Already have an account? Log in here" and log in with your existing NYT username/password. 1. The Group Pass gives you unlimited access to all content* on the NYTimes.com, including archived articles since 1851. You may read online as many articles per day as you wish but downloading articles from 1923 to 1980 is limited to five articles per day. If you need articles from the archive, you can also visit New York Times - Historical database for unlimited access to articles from 1851-2010. 2. Ongoing Use: Once you have activated your Academic Pass, students will have full access until you graduate. Faculty/Staff will have full access for 52 weeks (364 days). If you see a message that you are reaching the limit of free articles on the site, you’re probably not logged in. Simply log back in. *This subscription does not include e-reader editions, Premium Crosswords or The New York Times Crosswords apps. You can access NYTimes.com and INYT.com on any device with a browser. Mobile app access for smartphones and iPads is also provided with the Library subscription. Simply download the app on your device and log-in using your fairfield.edu email log-in. Please note: your access does NOT include the crossword apps. Remain logged into your NYTimes.com account to have seamless access to NYTimes.com for the duration of your Pass. 1. Having trouble logging in due to an existing NY Times account? See box labeled to left labeled What to Do if You Have an Existing Account? 2. If you are ever on the NYTimes site and you see a message about reaching the limit of free articles on the site, make sure you are logged into the NYTimes site with the credentials you used when activating your Group Pass. Navigate to accessnyt.com then search for and select Fairfield. You will then see: On campus click here and Off Campus click Go (you will need to login to school proxy). You will be redirected to the NYT welcome page. Click "Already have an account? Login here". 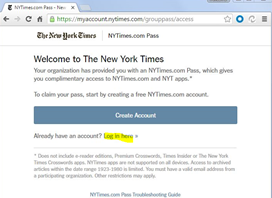 Log in with existing NYT username/password. Then on the nytimes.com site it should say "Digital Subscriber" under your name. Now you can enjoy seamless full access to NYTimes.com and NYTimes mobile apps. 4. Why are you being asked to login on some occasions and not others? This may be because your browser may clear its web cache/history if it is set to do so. In such cases you will need to log back into NYTimes.com, but you can still use your Group Pass. If you have questions, please contact the Library. Or check the New York Times Troubleshooting Guide if you are having problems obtaining an Academic Pass or are hitting a content limit. NYTimes.com/edu is a complimentary benefit to Academic Site License subscribers. This site is designed to help both educators and students make the most of The New York Times. Accessing all teaching resources is easy – simply visit NYTimes.com/edu, and click link “Register” at the upper right hand corner and use your school email address as your username. From there, follow the instructions to create an account. This site is separate from the NYTimes.com site license, yet same login may be used.